Find the appetizer recipe you’ve been searching for in this roundup of healthy appetizer ideas for Thanksgiving, just in time to fill out your Thanksgiving menu! Don’t just use your cornbread for your stuffing. This scrumptious cornbread bruschetta is gluten-free and vegan, and sure to be a perfect appetizer for Thanksgiving. Slice a baguette into rounds and start adding your toppings. These mini bean and cheese molletes are bite-sized morsels that never fail to fill your tummy and warm your heart. These spicy sweet potato pumpkin bites will allow the whole family to savor the flavors of the season, especially during the festive Thanksgiving feast. Spinach and mushrooms are my favorites, so these spinach stuffed mushrooms will not be missing from my Thanksgiving table. Serve it too! Another take on making mushrooms more appetizing: crab stuffed mushrooms. Pretty sure your guests will be drooling over these decadent bites. These super delicious meatballs are like Thanksgiving in one bite. 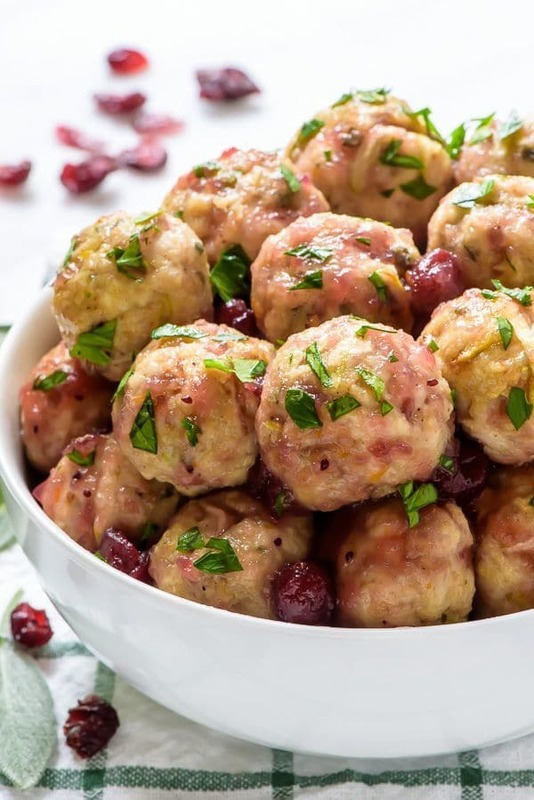 The whole family will love the sweet, juicy, and tangy flavor of these apple cranberry turkey meatballs. This sweet potato hummus will help you cut down on calories and fat since it uses Greek yogurt. Don’t forget the pita chips! Whether you are planning a vegetarian Thanksgiving or not, these adorable healthy brussels sprout sliders are sure to impress. Who knew brussels sprouts would make great mini burger buns, right? It’s a must-serve! Go Paleo with this a healthy and delicious snack! It doesn’t get healthier than fruit, right? Don’t miss this spiced Paleo apple dip at your family holiday feast. Love quinoa? You’ll enjoy it so much more when transformed into these coconut-crusted brie-stuffed quinoa bites. A tiny bite which is superbly stuffed with ooey-gooey brie. Looking for a unique Mediterranean flavor? These crazy Greek feta, sun-dried tomato, and pistachio truffles will be just the thing you’re looking for. It’s cheesy, salty, and delicious! What more could you ask for? Did you ever consider that pizza could be healthy, and finger food-sized, too? This butternut squash pizza will give you a big punch of flavor that’s impressive, considering its tiny size. These spinach puffs are super easy to make. You can even make them ahead and keep them frozen until you’re ready to warm and serve. This will make you consider eating your greens. With a combination of spinach and stuffing mix, who can dare to resist? I’m sure everyone in your gathering will love these spinach balls. This roasted acorn squash stuffed with quinoa mushroom pilaf give you both fall flavors and a gorgeous plate for your Thanksgiving feast. Make sure to give your guests a heads up–they may spend way too much time taking photos of this dish for Instagram, it will go cold! Nothing beats tradition! Make these classic deviled eggs for Thanksgiving and keep it plain and simple without jeopardizing the Thanksgiving flavor. Make a batch of these sweet potato cakes and don’t forget to top them off with the awesome black bean salsa! It elevates your ordinary sweet potato, that’s for sure. WOW, so good! Have your family and friends gather around with any of these healthy appetizer ideas for Thanksgiving while dinner is cooking. Serve 2 or more from this list of healthy appetizer ideas for Thanksgiving to kick off your dinner feast. We have a pretty good feeling these healthy Thanksgiving appetizers will be a huge hit! What do you think of these healthy appetizer ideas for Thanksgiving? Which one will you try? Let me know in the comments section below! Editor’s Note: This post was originally published on November 14, 2016, and has been updated for quality and relevancy.